The California coast is lined with 27 offshore oil and gas rigs that can be seen jutting out across the horizon—a reminder of humans’ dependence on fossil fuels. 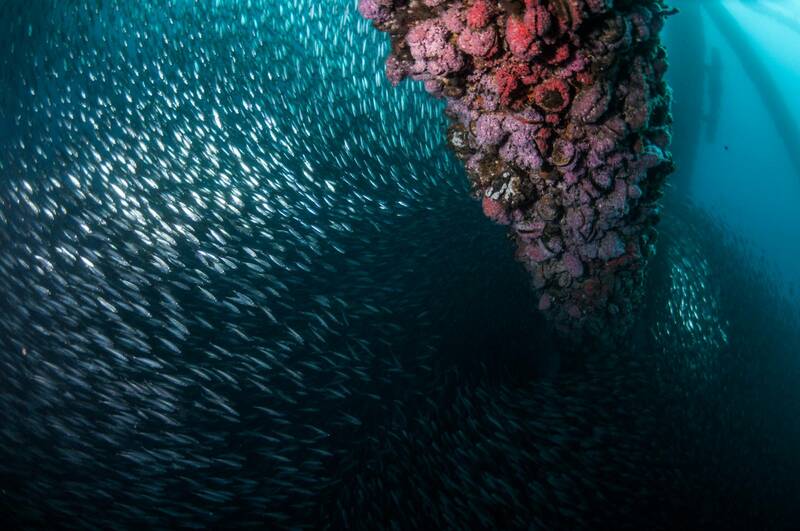 Below the surface, however, these platforms are home to some of the most dynamic ecosystems in the world, harboring everything from mussels and scallops to garibaldi and rockfish. As many of these enormous rigs are approaching the end of their viable production lives, scientists, environmental agencies, and oil companies are left begging the question: should the rigs stay or should they go? 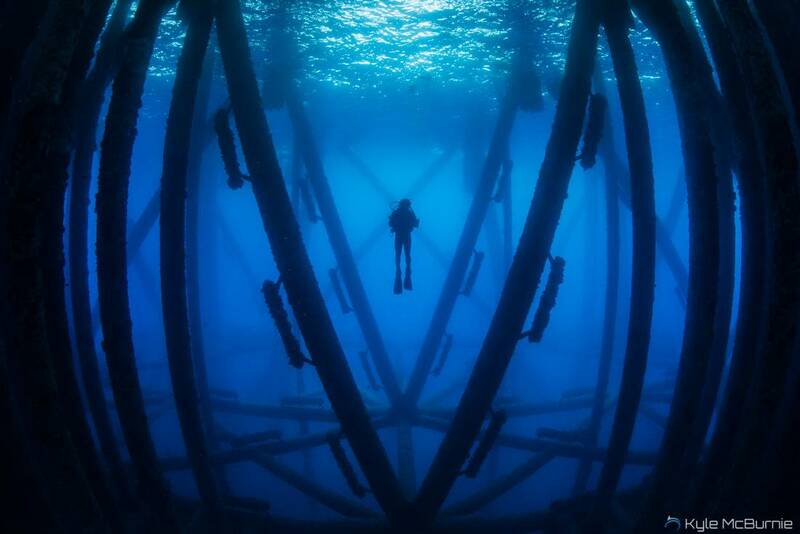 Emily Callahan and Amber Jackson, two alumnae of Scripps Institution of Oceanography at the University of California San Diego, have made it their mission to dive below the surface of these oil and gas platforms to determine the best possible “afterlife” scenario for these complex structures. The two women met in 2013 while taking a scientific diving course at Scripps Oceanography, where both were pursuing Master of Advanced Studies degrees in Marine Biodiversity and Conservation. 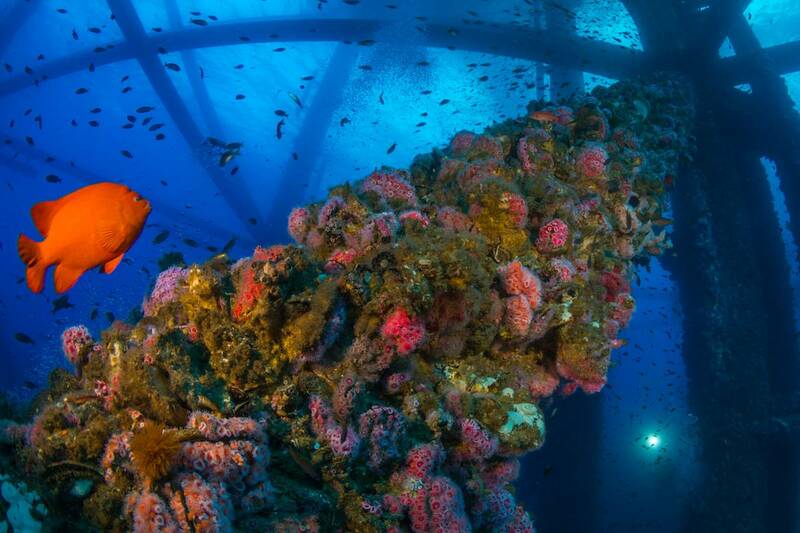 A conversation soon emerged about Rigs-to-Reefs, which is the name of a state law and associated program that essentially converts decommissioned oil and gas rigs into artificial reefs. “What you’re focusing on with Rigs-to-Reefs is everything below the surface, like the tip of the iceberg. That’s where all the life is,” said Callahan, a marine biologist and PADI certified divemaster with expertise in environmental consulting. 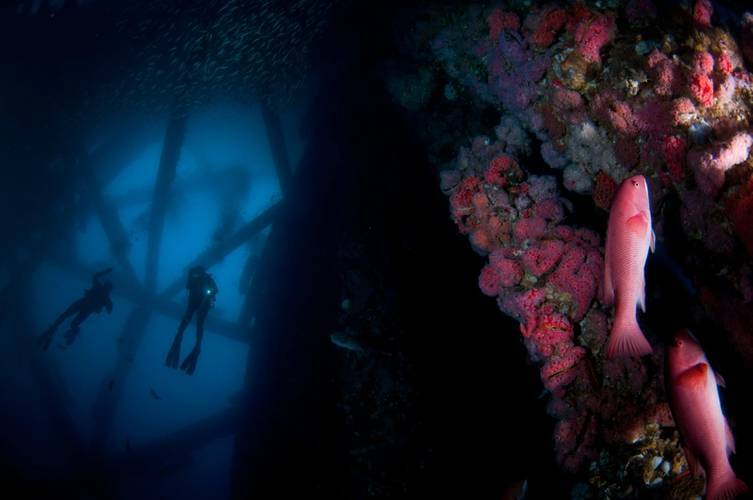 When she first came to Scripps, Callahan had only recently learned about the success of the Rigs-to-Reefs program in the Gulf of Mexico, where 500-600 decommissioned oil platforms now serve as artificial reefs and provide abundant fishing opportunities, world-class diving and recreational activities, and an ecological hotbed of underwater activity. She was stunned to learn that none of California’s rigs had been approved for a similar Rigs-to-Reefs conversion. Callahan shared her interest in the program with Jackson, who was equally enthralled. Inspired by the possibilities of Rigs-to-Reefs implementation in California, Callahan and Jackson focused their joint thesis on the topic. Their innovative research led them up and down the coast of California where they dived numerous platforms, conducted ROV surveys, studied the biodiversity of marine life on and around the structures, and analyzed the legislation surrounding Rigs-to-Reefs. They also documented their findings through video, photography, and social media—engaging visual mediums that have enabled them to show the public the beauty and importance of these thriving underwater regions. Rigs-to-Reefs is a controversial law and program in which an oil company chooses to modify a platform so it can continue to support the valuable and fragile ecosystems that have formed on and around the structures. The decommissioning process still holds platform operators responsible for removing drilling infrastructure and capping and sealing the well—and they remain permanently liable for any damages coming from the well—but the upper portion of the rig (at least 85 feet for ship clearance) is cut and towed to an alternate location or the structure is toppled on its side. Some environmental groups oppose the Rigs-to-Reefs program because it transfers liability of the structure from the oil companies to the state or the Department of Fish and Wildlife, which then manage it as an artificial reef. The program also saves the oil companies money, upwards of millions of dollars, but any savings are split 50/50 between the company’s stakeholders and the state, which is required to use that money for marine conservation and education—a silver lining according to Callahan and Jackson. After examining the Rigs-to-Reefs program from all angles, Callahan and Jackson determined that it would be a beneficial program for the state of California, providing an ecologically and environmentally friendly alternative to complete rig removal. 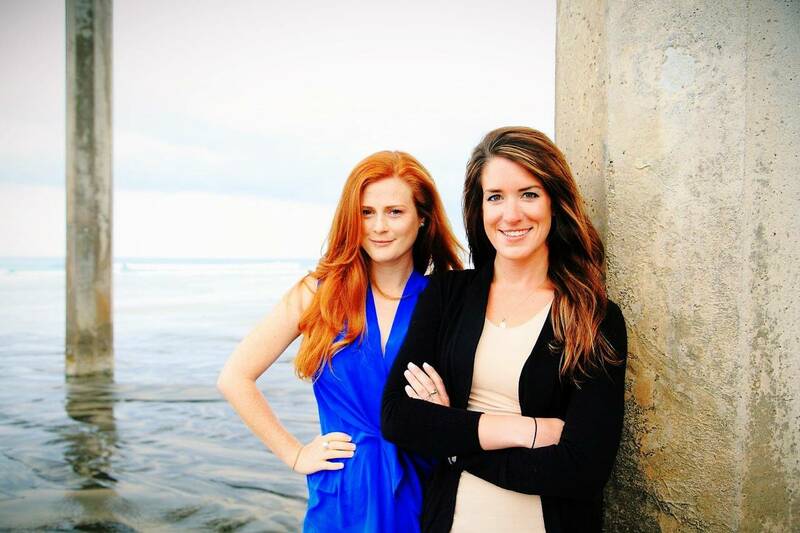 Upon graduation from Scripps in 2014, Callahan and Jackson decided to continue working together and co-founded Blue Latitudes, an organization that uses scientific research to form a comprehensive study of the ecological, socio-economic, and advocacy issues surrounding California's Rigs-to-Reefs law and program. Blue Latitudes provides neutral and scientifically based consulting services to various clients, including gas and oil companies and environmental groups, to assess structures and determine whether they are good candidates for Rigs-to-Reefs. Blue Latitudes also operates as a non-profit organization through a fiscal partnership with Mission Blue, a global initiative to protect the world’s oceans led by famed oceanographer Sylvia Earle. This wing of the company allows Callahan and Jackson to focus on education and outreach, and the two are currently forging relationships with teachers and schools across San Diego and Los Angeles and developing unique classroom curriculum about marine science for middle and high school students. The duo continues to spread the word about their research through speaking engagements at aquariums, libraries, classrooms, and more. And they are digitally savvy—constantly updating their social media accounts with stunning images from their latest diving adventures and information about their latest projects. They also educate audiences through a YouTube channel called ScienceSea TV, through their website, and as guest bloggers on National Geographic. The women credit their Scripps education with providing them the expertise needed to succeed as scientists, explorers, and entrepreneurs. “One thing I think we really took away from our master’s program at Scripps and at the Center for Marine Biodiversity and Conservation was not only understanding the science, but also understanding how to communicate it effectively,” said Jackson. The future looks bright for the ladies of Blue Latitudes, and they already have plans to expand their expertise to international waters. They have an expedition planned in March 2017 to Malaysia, where they will explore and assess the country’s platforms. Their long-term goals include researching the oil and gas platforms of Southeast Asia and Australia, all the while following their overarching goal of thinking creatively about the resources that we have and how to preserve the ecosystems thriving quietly below the surface. North East England-based Modus Seabed Intervention Limited is a relatively small business but its goals are ambitious and focused. 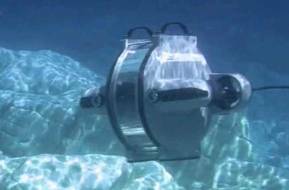 SeaBotix is the world leading manufacturer of MiniROV systems with a pedigree of underwater expertise. A dedication to providing a capable underwater solution unlike anything else. Teledyne Benthos, an industry leader, designs and manufactures rugged, reliable oceanographic instrumentation and sensor solutions for marine environments. EvoLogics GmbH develops underwater information and communication systems based on bionic concepts, combining cutting edge engineering with the best ideas found in nature. The advanced product features have become enabling technologies for deep water exploration and production.